City of Gastonia residents can talk trash – 432 tons of it! 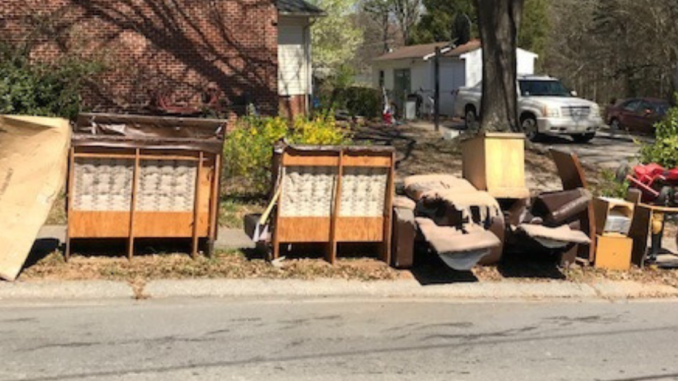 During the City of Gastonia’s recent Free Excess Household Trash Week, residents discarded more than 864,000 pounds of trash. That is 8% higher than the City’s previous record set during Free Trash week in March 2018. And this spring’s total is 66% higher than the City’s first Free Excess Household Trash Week in the spring of 2013. The majority of the excess trash collected at no extra cost was furniture, including mattresses. Although the City waived its bulky trash fees for residents the week of March 18, there is a price for disposing of hundreds of tons of extra trash in one week. The City paid $10,759 in landfill disposal fees and $6,093 in employee overtime costs for the service.